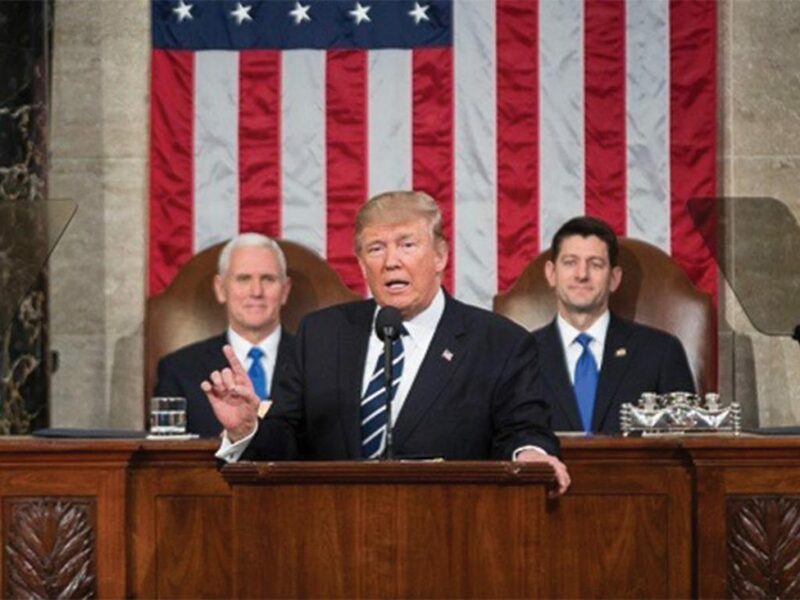 On Feb. 28, 2017, President Donald Trump gave his first address to a joint session of Congress, delineating and consolidating many of his campaign and executive proposals unrolled in the first hundred days of his office. This address to a joint session to Congress was ostensibly an attempt to clarify his program and present a united front for the administration, which has been plagued with problems since his inauguration. While this speech was unusually restrained from the pugnacious tone that his speeches generally take, the content showed a hypocritical one-note approach to social justice, with no signs of backing down from the oligarchic trajectory his administration is taking. Beginning on a note of unity, Trump foregrounded his speech on the same notion that he centered his campaign around: America first. He argued that the nation is “united by one very simple, but crucial demand, that America must put its own citizens first.” What followed, with usual Trumpian panache, was a series of promises and policy proposals which will “bring thousands of jobs back”: Regulation rollbacks, limits to lobbying and bolstering funds to the military. Many, if not all, of these proposals were couched on the idea that the president is bringing power back to the United States, which has been weakened on the world stage. Of course, there is in a sense little sentiment to disagree with — the statements, as they are, are not inherently problematic nor antithetical to a just vision of America. Contextually, however, this speech does very little to assuage the fears of minorities, nor does it add any extra dimension to the policies he has enacted through his flurry of early executive orders; they merely justify them. There is in effect, nothing said for immigrants or Latinos afraid of persecution, of Muslims travelling affected by his ban, to transgender students who are worried about his recent rollback of protections. In short, for anyone negatively affected by his policies, there was no attempt by Trump to assuage their fears or any word of hope. In fact, for some communities this speech heightened anxieties about their safety. Trump unveiled a program titled Victims of Immigration Crime Engagement (VOICE) which will track crimes by undocumented immigrants. This plan will unduly heighten the visibility of a small sector of crime, thus giving fodder for white supremacist movements and American isolationists. While undocumented immigrant crime ought to be addressed, this program falls exactly in line with the racialized approach to criminal justice that has historically been part and parcel of racism in this country. VOICE, in tandem with his recent renewal of the Muslim ban, make his statements on unity hollow and myopic. The backbone of this speech finds Trump doubling down on his brand of fear-mongering against the threat of the “other,” whether that threat be Muslims, Latinos or any other non-white group, and positioning himself as the sole savior for the country: “We must restore integrity and the rule of law at our borders.” The plans to eradicate cartels which are ravaging the country, of Muslim terrorists plotting attacks, of foreign countries stealing jobs, nonetheless take the form of increased executive force, with a renewed focus on military power. Do people in Flint, Michigan still need clean water? Of course, but this is not reflected at all in the program unveiled by the administration. In fact, none of the programs exactly reflect the interests or needs of communities of color, or LGBTQ communities. His plans to cut environmental regulation “that threaten the future and livelihood (…) of coal miners,” reflecting the interest of a white working class primarily in the Midwest and South, is the only genuine reference to disadvantaged communities. Given this problematic context, this speech enacts an erasure of voices of marginalized communities, which have been clearly expressing their concerns — whether that be in the form of the Women’s March, the Day Without Immigrants protest, etc. The speech, while in tone a dramatic shift for Trump, does not reflect anything of the kind in its content.